Manchester United goalkeeper David de Gea is reportedly open to signing a new long-term contract, provided the club can match his wage demands. Amidst this, there has constantly been speculation regarding the Spaniard's future at the club but according to The Sun, the shot-stopper remains open to the possibility of signing a fresh contract. Still, the Mancunian giants are unlikely to have an easy route towards extending the keeper's contract, given the Spaniard is said to want at least a 50 percent increase on his current £200,000-a-week wages. 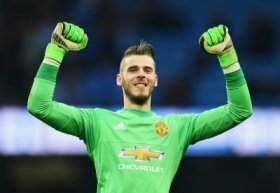 De Gea has been linked with the likes of Juventus and Paris Saint-Germain over the past six months but neither of those sides are expected to make an approach until the summer at the least.